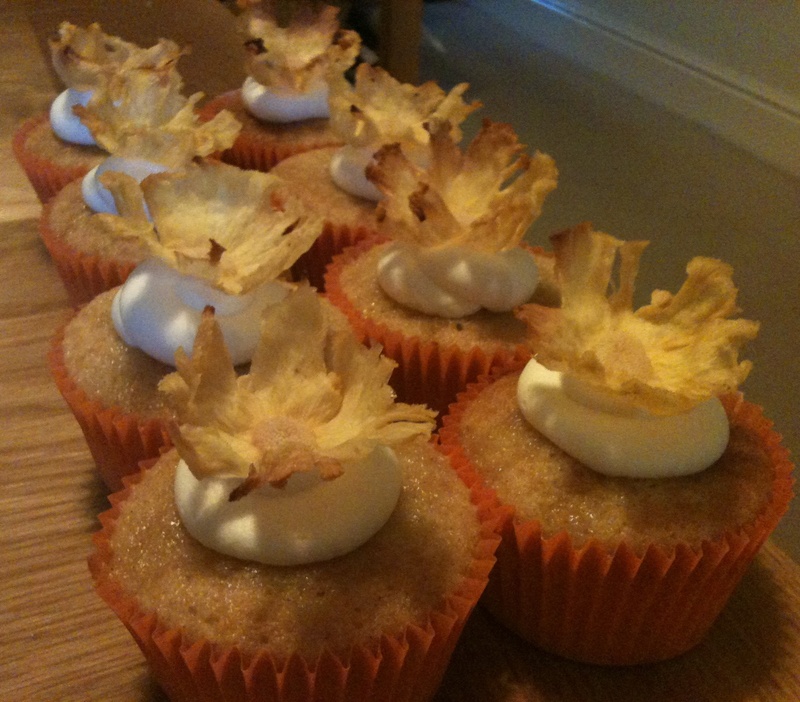 Since I’ve got four cocktail cupcakes to write about, here’s the next one… Pina Colada! 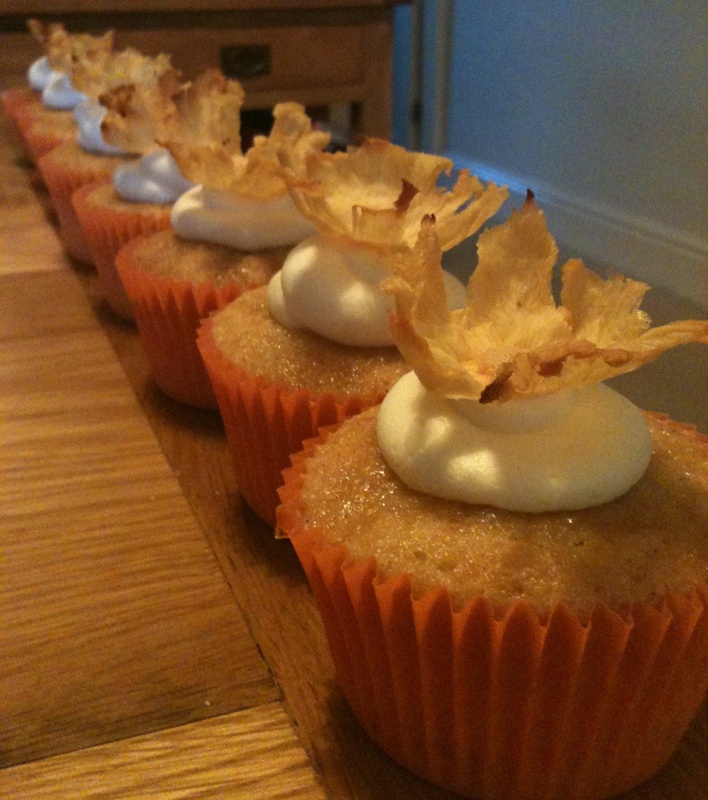 Again, these were from The Hummingbird Bakery Cake Days. There are 4 different mini cocktail cupcake recipes in the book and I made three of them – I didn’t make the Strawberry Daiquiri ones since my birthday is in February and although I probably could have got hold of strawberries (since you seem to be able to get any fruit at any time of year these days) I decided that they probably wouldn’t be that tasty so instead opted for White Russian ones. Bake for about 30 minutes and then turn them all over and bake for another 30 minutes until dried out – they should be dry to the touch and browning slightly at the edges. Using a palette knife take them off the baking trays and place them in a mini muffin tin (see the photo above) so that they curl up at the edges, and leave somewhere overnight to dry completely. In a saucepan bring the white rum and 60g of the sugar to the boil, reduce by half and set aside to cool. Chop each pineapple ring into 8 pieces and place in the rum reduction to soak for 30-40 minutes. Mix the remaining sugar, flour, butter, baking powder and salt together in a stand mixer (or rub in with your hands) until the mixture resembles fine breadcrumbs. Beat the coconut milk, eggs and vanilla together in a jug and then gradually beat into the dry ingredients until smooth (ensuring that you scrape down the sides of the bowls after each addition). 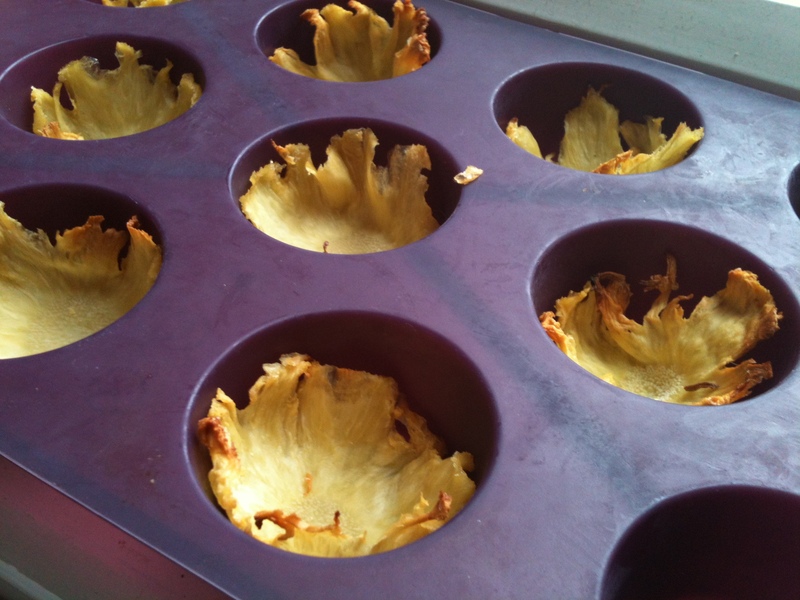 Drain the pineapple from the rum reduction (save the liquid for later) and place 4 pieces in the bottom of each cupcake case then spoon the cake mixture on top and bake in the oven for 18-20 minutes until they are lightly browned on top and spring back when pressed (and a skewer comes out clean). I usually check them and turn them around after 15 minutes. Take out the tins immediately and whilst still warm, drizzle a teaspoon of the reserved rum reduction over each cake. Leave to cool on a wire rack. Decorate once completely cool. Beat the icing sugar and butter together on a very slow speed until the mixture resembles coarse breadcrumbs. I always put a tea towel over the top of my KitchenAid to prevent icing sugar going everywhere! Then slowly add the coconut milk and white rum. Once it’s all been added increase the speed and beat on high for 5 minutes until light and fluffy. This looks like a brilliant recipe! Thanks for sharing it. I’ve made little cakes with fruit at the bottom before, but I often find that the fruit stick to the bottom of the cases. Any tips? Hey, sorry for the delay – had a bit of a break from blogging! It depends on the cases you use – I find some stick more than others. Other than that I don’t know what to suggest!